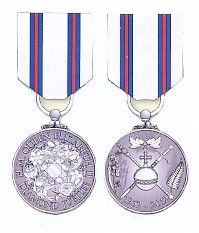 THE QUEEN'S DIAMOND JUBILEE 2012 MEDAL. To Commemorate the Diamond Jubilee of Her Majesty Queen Elizabeth the Second on 6th.,February 2012, this medal is now available to all who served in uniform as a lasting memento of her sixty glorious years as Monarch. This superb quality die-struck medal has been produced by one of the UK's leading medallists in the heart of Birmingham's world famous Jewellery Quarter. The multi faceted diamond in the centre of the obverse is surrounded by the interwoven flowers of the Rose, Thistle, Daffodil and Shamrock representing the United Kingdoms of England, Scotland, Wales and Northern Ireland. The Ord, Sceptre and Sword on the reverse are surrounded by the Wattle, Maple Leaf and Fern representing the Dominions of Australia Canada and New Zealand. The Medal is supplied in a red presentation box and is mounted on a Brooch bar ready for wearing. A mounted Dress miniature and separate Pin-on Ribbon bar are also available. The medal may be personalised by the addition of engraving the recipients name around the rim. The medal is also available to next of kin or on behalf of the recipient, making is a wonderful and historic gift for those unable or too modest to apply in person. The Royal Centre for Defence Medicine, Patient Welfare Fund, Selly Oak Hospital, Birmingham.